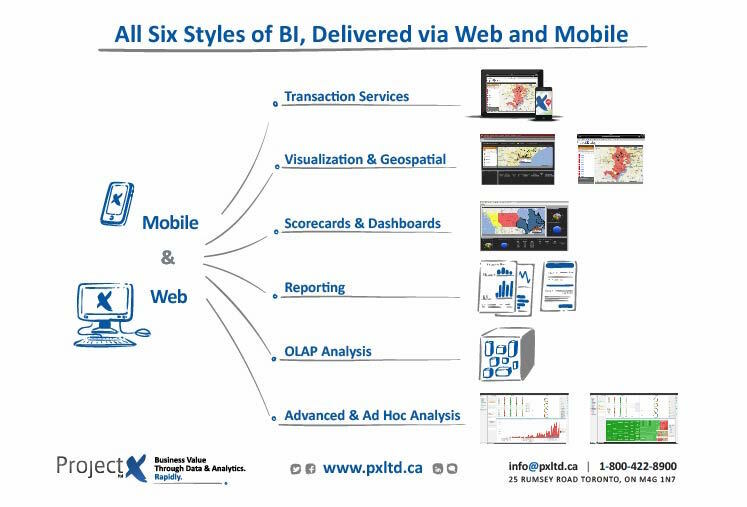 The BI platform provides a user interface to business people with which they can interact with their company’s data in any of 6 different ways – which we call the 6 Styles of BI (pictured above). Many BI tools support one or two of these styles of BI within the same architecture, but with the proper architecture, you can get all 6 Styles of BI within the exact same user interface and all built on the exact same building blocks (called metadata). When you work with us we uncover the real value of a BI platform, which allows companies use to create and deploy reports, dashboards, and visualizations that can be deployed and analyzed across your organization. One major advantage is the self-serve option that allows anyone with access to create and drive insights on the fly. By leveraging all six styles of BI organizations can increase the accuracy, reduce the complexity of understanding your business and reduce the cost while increasing the visibility and understanding of your data. To chat with us about a solution reach out today!